Planning a visit to the Finger Lakes region this summer? Well, believe it or not, you’re not alone! Thousands of tourists head for the sunny natural beauty of the Finger Lakes each year, and the region continues to grow in popularity as a summer tourist spot. This is why March is a good time to secure a place to stay for the summer. Take it from those in the know…if you wait too long to book your Finger Lakes accommodations, your options are going to be of far less quality than they will be if you do it now. People who want to find a wonderful place to stay always check out the lakefront properties first, because these are luxurious Finger Lakes vacation rentals that will enhance your stay beyond measure. Imagine going on vacation and having a chance to stay in a real condo, or home, that is a hop, skip and jump away from a beautiful lake. Well, you don’t have to just dream about it, because this is well within your reality. That is, if you choose to stay at one of our Skaneateles luxury rentals. By “luxury” we mean you’ll have the place all to yourself to do as you please. Our homes feature comfortable bedrooms, bathrooms, and spacious living rooms with fireplace, comfy couches and picturesque views. There is also a kitchen area where you can prepare meals. Some of our homes have porches, or patios, where you can kick back and relax while watching the sunset. Feel like going for a stroll around the lake? When you book one of our luxury homes you’ll be within easy walking distance to sparkling Skaneateles Lake, which has long been a big favorite of tourists coming here from near and far. Spending your vacation time near a lake is nourishing for the soul, as well as the mind. Water definitely has a relaxing effect on people. And, you’ll get plenty of chances to hang out at the lakefront as much as you want. Or, you can take a boat ride and experience being on the lake itself. 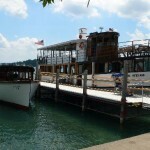 One thing you’ll notice is that Skaneateles Lake has crystal clear waters. You’ll delight at watching all the boats and yachts sail on the waters. Many boats dock just outside the Skaneateles Country Club. The lake is a main feature of the Village of Skaneateles, which has its own unique charms. Once here, you’ll immediately feel right at home as you stroll along village streets, visiting local restaurants and shops. The village is also ideally located within driving distance to other central New York attractions. This area is filled with historical importance, as well as, activities such as wine tours that are endlessly appealing. In order to take full advantage of the Finger Lakes lifestyle, you’ll want to book a Skaneateles luxury vacation home early. Contact us today and get a jump on your summer fun. Come out to the Corning Museum of Glass for a wonderful evening of family fun, glassmaking and entertainment. Kids will get a kick out of Bubblemania, which creates giant floating bubble spheres that actually bounce! Everyone will be amazed by the glassblowing exhibition. Even better is getting to design and make your own piece of glass. Food and refreshments are available. Contact 607-438-5500 for more information. March 6. This premier wine retailer is holding a free wine tasting event for visitors. Marjim Manor fruit wines are available for tasting between 2pm and 5pm. Visitors also have the opportunity to taste white, red and Pinot Gris from Hector Wine Co. March 7. The sun is sure to come out when you attend one of Broadway’s most beloved musicals. Annie is a tale about an orphan whose life is changed when she meets a rich man, who can use a bit of sunshine in his life too. Call the box office for ticket information at 585-222-5000. March 10 – 15. Here’s an opportunity to match wine tasting with popular Irish dishes such as Irish stew, potato soup, scones and more. Varick Winery wines are paired perfectly with each food selection. This is a great way to begin celebrations for St. Patty’s Day. March 14 – 15. Anyone who feels extra lucky on St. Patrick’s Day is welcome to celebrate the luck of the Irish at the casino. Live entertainment includes Irish dancers and musicians. Enjoy a traditional Irish meal including corned beef brisket, shepherd’s pie, cabbage vegetable medley, cheddar bangers, soup and more. Complimentary Irish hats and beads are given to all visitors. March 17. There’s no better time to check out local Finger Lakes vacation rentals than right now. Book yourself a cozy home away from home to relax and enjoy all the great activities happening here this month.